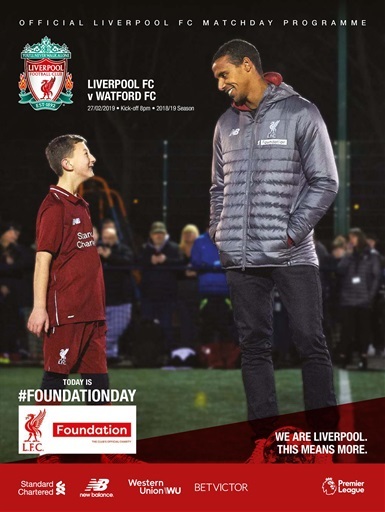 It's another 'cup final' in another big week, says captain Jordan Henderson in his programme notes, adding that the team is 'loving' the pursuit of Premier League and Champions League glory. Elsewhere in the official matchday programme we have interviews with both Mo Salah and Sadio Mane, Alex Oxlade-Chamberlain's career in photos and we celebrate 10 years of LFC Foundation on this season's Foundation Day. The official matchday programme of the Liverpool v Watford fixture is on sale now.